Figure A85. Sunda anomaly, interpreted as the Sunda slab, with (horizontal) [vertical] cross sections through (A)[D] the UUP07 p-wave) and (B)[D] the combined SL2013 and S40RTS s-wave models at 470 km; C) the location of the modern geological record that we interpret to have formed during the subduction of the slab. The Sunda anomaly (Figure A85) was previously imaged by Widiyantoro and van der Hilst (1996; 1997), Replumaz et al. (2004), Spakman and Hall (2010), Pesicek et al. (2010), Widiyantoro et al. (2011), Fukao and Obayashi (2013), Koulakov (2013), Zahirovic et al. (2014), Hall and Spakman (2015), and Wu et al. (2016). It is interpreted as Australian and Indian plate lithosphere that is actively subducting northward below Sundaland, along the Sumatra and Java trenches. To the northwest it is disconnected through a slab window below the Andaman Islands from the Burma slab.In the East it connects to the Banda slab. In the west, tomographic images show that the Sunda slab reaches the base of the upper mantle, but does not connect with deeper anomalies. 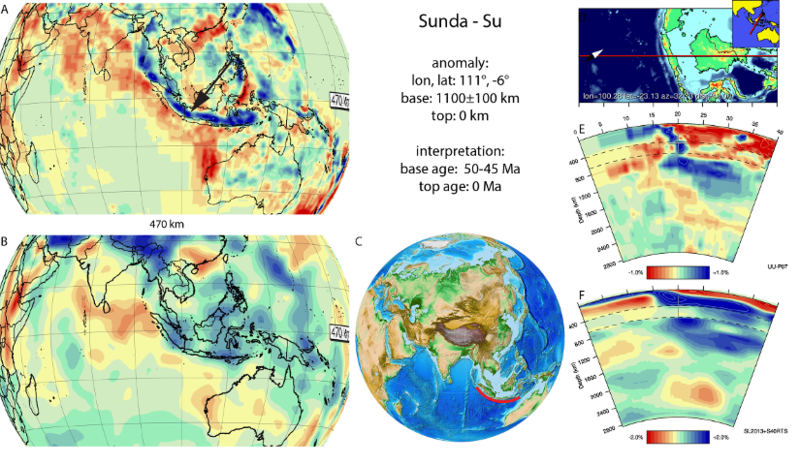 In the east, however, the Sunda slab merges with the SW-NE trending Kalimantan anomaly and several authors (e.g. Replumaz et al., 2004; Zahirovic et al., 2014) suggested that these slabs may be contiguous. The different orientation of the Kalimantan slabs from the Sunda slab, however, suggests that these slabs result from separate subduction events instead (Hall & Spakman 2015, Wu et al., 2016). For the Kalimantan anomaly the kinematic restoration of Hall (2012) combined with the interpretation of mantle structure by Hall and Spakman (2015) suggests a NW-ward subduction event below western Sulawesi from the latest Cretaceous to the middle Eocene. This same reconstruction suggested that the Sunda trench was in Late Cretaceous to Paleocene time a transform boundary, which became inverted as a subduction zone ~50-45 Ma ago upon the onset of Australia-Eurasia convergence, subducting Indo-Australian oceanic crust towards the NE. We adopt this as the age for the base of the Sunda slab. Disagreement between these reconstructions exists for the eastern extent of the Sunda slab. This subduction either continued as northward subduction of Indo-Australian oceanic lithosphere, offset by a dextral transfer zone (Hall and Spakman, 2015) or as southward subduction of the western part of an East Asian Sea (Wu et al., 2016).